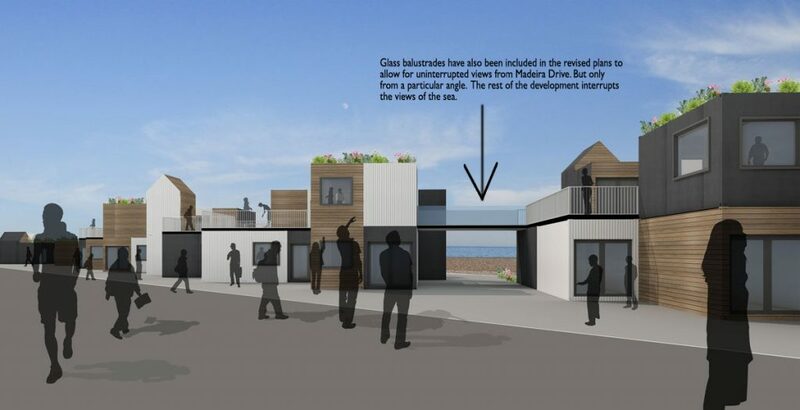 Although this application has now been approved, the Brighton Society considers it important to note that our most of our initial objections to the previous gaudily coloured shipping containers still apply to the revised Sea Lanes application. 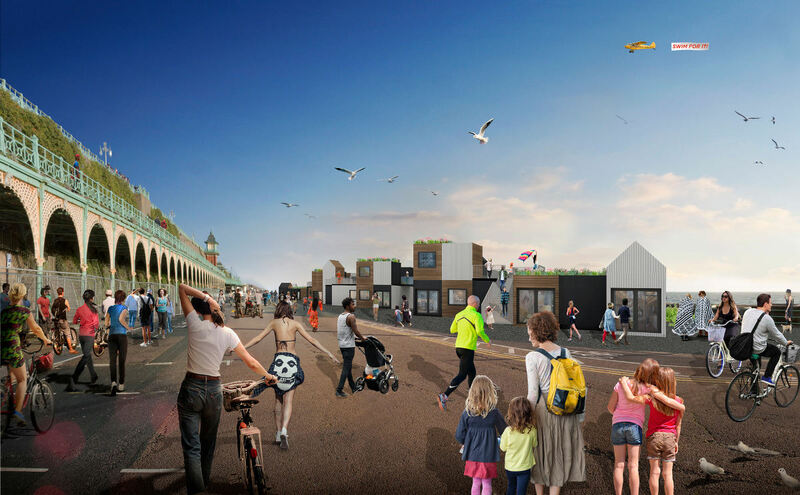 Furthermore, the legacy of the 2019 Brighton and Hove Planning committee, who approved this scheme, will have a negative impact on the future of Brighton and Hove seafront. Its scale and appearance would be out of character with the site’s important location on Madeira Drive within the East Cliff Conservation Area and close to the Listed Madeira Terraces and would have a detrimental effect on both these Heritage assets. These detrimental effects are further emphasised by the temporary character of the proposed structures proposed which are a direct result of the proposed 5-year limit on the planning approval. Peter Pan’s playground currently detracts from the appearance of the conservation area due to its random collection of ramshackle buildings and other structures and the poor quality of its immediate environment. The council will seek to use its powers to achieve a better quality children’s play area, with buildings and structures clustered together in a visually co-ordinated manner, and high quality hard and soft landscaping appropriate to the seafront location. Replacement buildings of a high standard of design will be encouraged, which respect the appearance of the conservation area not only in views along Madeira Drive and from the beach, but also from Marine Parade above. No expansion of the boundary of the playground will be acceptable. Single storey buildings only will be appropriate, with careful attention paid to the design and material of the roofs, and no amusement or ride should exceed the pavement height of Marine Parade, including when in use. Although this application is not for a playground, the planning criteria are just as valid in the case of this application. We would pose the following questions: the answers confirm our views. 1. Is this design of high enough quality? 2. To what extent is the quality of design and appearance related to the temporary nature of the proposal? Answer: The temporary nature of the structures has had a major effect on the quality of the design. A permanent scheme would require a much higher level of design quality. So why should this proposal even be considered in such a sensitive and historic area of the city? 3. How well will the temporary buildings weather during the five year period? Answer: we are very dubious that the appearance will be the same at the end of the five year period as it might be at the beginning. In fact it could look decidedly tatty. Is that what we want to see on our seafront? 4. To what extent does it prejudice the views of the beach and sea from Madeira Drive, Madeira Terraces and Marine Parade? Answer: with the exception of a few passageways through the buildings views of the sea will be blocked. Because many of the buildings are two-storey – in contravention of the recommendations on the CA Character Statement – views through to the sea beyond from the upper levels of Madeira Terraces will also be partially blocked. 5.1 will it set a visual precedent for a more permanent proposal? Answer: There is a danger that it might unless strict conditions based on the recommendations in the CA Character Statement are imposed at this stage. 5.2 should it set a precedent for the permanent scheme? Answer: In our view most definitely not. 5.3 will there not be a temptation to leave sections – or even the whole development – in place, rather than remove it altogether? Answer: Yes – the applicants will inevitably wish to argue for retention of some if not all of the structures at the end of the 5-year period. This will – if this application is approved – lead to the disadvantages of this proposal in terms of quality of design, and respect for important Heritage assets, being permanently imposed on the city.